Red Hat OpenShift Container Platform provides developers and IT organizations with a cloud application platform for deploying new applications on secure, scalable resources with minimal configuration and management overhead. 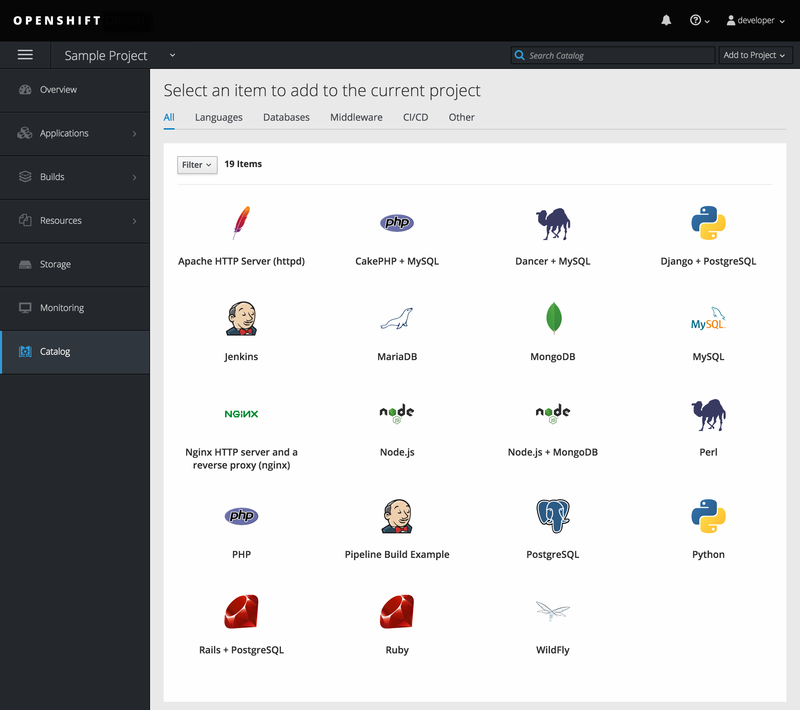 OpenShift Container Platform supports a wide selection of programming languages and frameworks, such as Java, Ruby, and PHP. Built on Red Hat Enterprise Linux and Kubernetes, OpenShift Container Platform provides a secure and scalable multi-tenant operating system for today’s enterprise-class applications, while providing integrated application runtimes and libraries. OpenShift Container Platform enables organizations to meet security, privacy, compliance, and governance requirements. Red Hat OpenShift Container Platform version 3.9 (RHBA-2018:0489) is now available. This release is based on OpenShift Origin 3.9. New features, changes, bug fixes, and known issues that pertain to OpenShift Container Platform 3.9 are included in this topic. To better synchronize versions of OpenShift Container Platform with Kubernetes, Red Hat did not publicly release OpenShift Container Platform 3.8 and, instead, is releasing OpenShift Container Platform 3.9 directly after version 3.7. See Installation for information on how this impacts installation and upgrade processes. OpenShift Container Platform 3.9 is supported on RHEL 7.3, 7.4, and 7.5 with the latest packages from Extras, including Docker 1.13. It is also supported on Atomic Host 7.4.5 and newer. The docker-latest package is now deprecated. TLSV1.2 is the only supported security version in OpenShift Container Platform version 3.4 and later. You must update if you are using TLSV1.0 or TLSV1.1. For initial installations, see the Installing a Cluster topics in the Installation and Configuration documentation. To upgrade to this release from a previous version, see the Upgrading Clusters topic. This release adds improvements related to the following components and concepts. Now, when pruning images, you do not have to remove the actual image, just update etcd storage. It is safer to run --keep-tag-revisions and --keep-younger-than. After this is run, administrators can choose to run hard prune (which is safe to run as long as the registry is put in read-only mode). The installation playbooks in OpenShift Container Platform 3.9 have been updated to support Red Hat CloudForms Management Engine (CFME) 4.6, which is now currently available. See the new Deploying Red Hat CloudForms on OpenShift Container Platform topics for further information. Alert management: You can choose Prometheus (currently in Technology Preview) and use it in CloudForms. 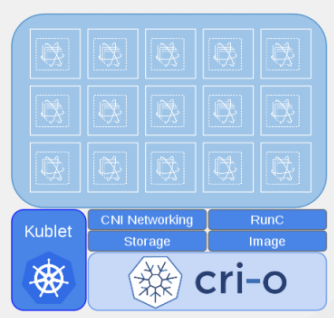 CRI-O is a lightweight, native Kubernetes container runtime interface. By design, it provides only the runtime capabilities needed by the kubelet. CRI-O is designed to be part of Kubernetes and evolve in lock-step with the platform. A minimal and secure architecture. The ability to run any Open Container Initiative (OCI) or docker image. Familiar operational tooling and commands. CRI-O can only be installed as an RPM. The previously-available system container for CRI-O has been dropped from Technology Preview as of OpenShift Container Platform 3.9. The atomic-openshift-node service must be RPM- or system container-based when using CRI-O; it cannot be docker container-based. The installer protects against using CRI-O with docker container nodes and will halt installation if detected. When CRI-O use is enabled, it is installed alongside docker, which currently is required to perform build and push operations to the registry. Over time, temporary docker builds can accumulate on nodes. You can optionally set the following parameter to enable garbage collection. You must configure the node selector so that the garbage collector runs only on nodes where docker is configured for overlay2 storage. For example, the above would ensure it is only run on nodes with the runtime: cri-o label. This can be helpful if you are running CRI-O only on some nodes, and others are only running docker. See the upstream documentation for more information on CRI-O. You can expand persistent volume claims online from OpenShift Container Platform for CNS glusterFS, Cinder, and GCE PD. Create a storage class with allowVolumeExpansion=true. The PVC uses the storage class and submits a claim. The PVC specifies a new increased size. The underlying PV is resized. You can expand persistent volume claims online from OpenShift Container Platform for CNS glusterFS volumes. This can be done online from OpenShift Container Platform. Previously, this was only available from the Heketi CLI. You edit the PVC with the new size, triggering a PV resize. This is fully qualified for glusterFs backed PVs. Gluster-block PV resize was added with RHEL 7.5. Add allowVolumeExpansion=true to the storage class. Edit the spec.resources.requests.storage field with the new value. Container Native Storage GlusterFS is extended to provide volume metrics (including consumption) through Prometheus or Query. Metrics are available from the PVC endpoint. This adds visibility to what is being allocated and what is being consumed. Previously, you could only see allocated size of the PVs. Now, you know how much is really consumed so, if needed, you can expand it before it runs out of space. This also allows administrators to do billing based on consumption, if needed. In the OpenShift Container Platform advanced installer, the CNS block provisioner deployment is fixed and the CNS Un-install Playbook is added. This resolves the issue of CNS block deployment with OpenShift Container Platform and also provides a way to uninstall a failed installation of CNS. CNS storage device details are added to the installer’s inventory file. The advanced installer manages configuration and deployment of CNS, file and block provisioners, registry, and ready-to-use PVs. Tenant-driven storage snapshotting is currently in Technology Preview and not for production workloads. Tenants now have the ability to leverage the underlying storage technology backing the persistent volume (PV) assigned to them to make a snapshot of their application data. Tenants can also now restore a given snapshot from the past to their current application. An external provisioner is used to access the EBS, GCE pDisk, and HostPath, and Cinder snapshotting API. This Technology Preview feature has tested EBS and HostPath. The tenant must stop the pods and start them manually. The administrator runs an external provisioner for the cluster. These are images from the Red Hat Container Catalog. The tenant can create a snapshot of a PVC named gce-pvc and the resulting snapshot will be called snapshot-demo. Now, they can restore their pod to that snapshot. Updated guidance around Cluster Limits for OpenShift Container Platform 3.9 is now available. This is a feature currently in Technology Preview and not for production workloads. Device plug-ins allow you to use a particular device type (GPU, InfiniBand, or other similar computing resources that require vendor-specific initialization and setup) in your OpenShift Container Platform pod without needing to write custom code. The device plug-in provides a consistent and portable solution to consume hardware devices across clusters. The device plug-in provides support for these devices through an extension mechanism, which makes these devices available to containers, provides health checks of these devices, and securely shares them. A device plug-in is a gRPC service running on the nodes (external to atomic-openshift-node.service) that is responsible for managing specific hardware resources. See the Developer Guide for further conceptual information about Device Plug-ins. CPU Manager is a feature currently in Technology Preview and not for production workloads. See Using CPU Manager for more information. Device Manager is a feature currently in Technology Preview and not for production workloads. The kubelet now houses a device manager that is extensible through plug-ins. You load the driver support at the node level. Then, you or the vendor writes a plug-in that listens for requests to stop/start/attach/assign the requested hardware resources seen by the drivers. This plug-in is deployed to all the nodes via a daemonSet. See Using Device Manager for more information. Huge pages is a feature currently in Technology Preview and not for production workloads. Memory is managed in blocks known as pages. On most systems, a page is 4Ki. 1Mi of memory is equal to 256 pages; 1Gi of memory is 256,000 pages, and so on. CPUs have a built-in memory management unit that manages a list of these pages in hardware. The Translation Lookaside Buffer (TLB) is a small hardware cache of virtual-to-physical page mappings. If the virtual address passed in a hardware instruction can be found in the TLB, the mapping can be determined quickly. If not, a TLB miss occurs, and the system falls back to slower, software-based address translation, resulting in performance issues. Since the size of the TLB is fixed, the only way to reduce the chance of a TLB miss is to increase the page size. In OpenShift Container Platform, applications in a pod can allocate and consume pre-allocated huge pages. See Managing Huge Pages for more information. All outgoing external connections from a project share a single, fixed source IP address and send all traffic via that IP, so that external firewalls can recognize the application associated with a packet. It is semi-automatic in that in the first half of implementing the automatic namespace-wide egress IP feature, it implements the "traffic" side. Namespaces with automatic egress IPs will send all traffic via that IP. However, it does not implement the "management" side. Nothing automatically assigns egress IPs to nodes yet. The administrator must do that manually. See Managing Networking for more information. Route configuration changes and process upgrades performed under heaving load have typically required a stop and start sequence of certain services, causing temporary outages. In OpenShift Container Platform 3.9, HAProxy 1.8 sees no difference between updates and upgrades; a new process is used with a new configuration, and the listening socket’s file descriptor is transferred from the old to the new process so the connection is never closed. The change is seamless, and enables our ability to do things, like HTTP/2, in the future. In OpenShift Container Platform, statefulsets, daemonsets, and deployments are now stable, supported, and out of Technology Preview. User login and logout from (including session timeout) the web interface, including unauthorized access attempts. Dynamic Admission Controller Follow-up is a feature currently in Technology Preview and not for production workloads. An admission controller is a piece of code that intercepts requests to the Kubernetes API server prior to persistence of the object, but after the request is authenticated and authorized. Example use cases include mutation of pod resources and security response. See Custom Admission Controllers for more information. Platform administrators now have the ability to turn off specific features to the entire platform. This assists in the control of access to alpha, beta, or Technology Preview features in production clusters. Feature gates use a key=value pair in the master and kubelet configuration files that describe the feature you want to block. Restructured playbooks to push all fact-gathering and common dependencies up into the initialization plays so they are only called once rather than each time a role needs access to their computed values. Refactored playbooks to limit the hosts they touch to only those that are truly relevant to the playbook. Quick Installation is now deprecated in OpenShift Container Platform 3.9 and will be completely removed in a future release. The installer automatically handles stepping the control plane from 3.7 to 3.8 to 3.9 and node upgrade from 3.7 to 3.9. Control plane components (API, controllers, and nodes on control plane hosts) are upgraded seamlessly from 3.7 to 3.8 to 3.9. Data migration happens pre- and post- OpenShift Container Platform 3.8 and 3.9 control plane upgrades. Other control plane components (router, registry, service catalog, and brokers) are upgraded from OpenShift Container Platform 3.7 to 3.9. Nodes (node, docker, ovs) are upgraded directly from OpenShift Container Platform 3.7 to 3.9 with only one drain of nodes. OpenShift Container Platform 3.7 nodes operate indefinitely against 3.8 masters should the upgrade process need to pause in this state. Logging and metrics are updated from OpenShift Container Platform 3.7 to 3.9. It is recommended that you upgrade the control plane and nodes independently. You can still perform the upgrade through an all-in-one playbook, but rollback is more difficult. Playbooks do not allow for a clean installation of OpenShift Container Platform 3.8. See Upgrading Clusters for more information. Docker log driver is set to json-file as the default for all nodes. Docker log-driver can be set to journal, but there is no log rate throttling with journal driver. So, there is always a risk for denial-of-service attacks from rogue containers. Fluentd will automatically determine which log driver (journald or json-file) the container runtime is using. Fluentd will now always read logs from journald and also /var/log/containers (if log-driver is set to json-file). Fluentd will no longer read from /var/log/messages. See Aggregating Container Logs for more information. You can deploy Prometheus on an OpenShift Container Platform cluster, collect Kubernetes and infrastructure metrics, and get alerts. You can see and query metrics and alerts on the Prometheus web dashboard. Alternatively, you can bring your own Grafana and hook it up to Prometheus. See Prometheus on OpenShift for more information. Previously, Jenkins worker pods would often consume too much or too little memory. Now, a startup script intelligently looks at pod limits and environment variables are appropriately set to ensure limits are respected for spawned JVMs. CLI plug-ins are currently in Technology Preview and not for production workloads. Usually called plug-ins or binary extensions, this feature allows you to extend the default set of oc commands available and, therefore, allows you to perform new tasks. See Extending the CLI for information on how to install and write extensions for the CLI. Previously, there was not a way to set a default toleration on build pods so they could be placed on build-specific nodes. The build defaulter is now updated to allow the specification of a toleration value, which is applied to the build pod upon creation. See Configuring Global Build Defaults and Overrides for more information. See Handling Out of Resource Errors for more information. Quickly get to the catalog from within a project by clicking Catalog in the left navigation. 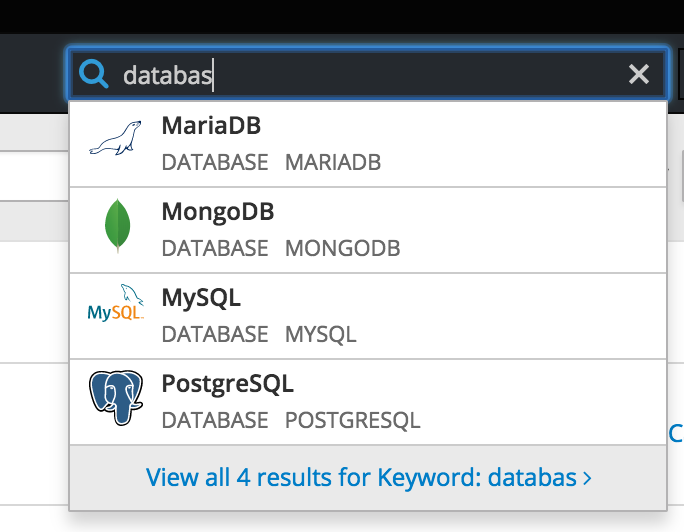 To quickly find services from within project view, type in your search criteria. You can now jump straight to certain pages after login. Access the menu from the account dropdown, choose your option, then log out, then log back in. The web console is now separated out of the API server. The web console is packaged as a container image and deployed as a pod. Configure via the ConfigMap. Changes are auto-detected. Masters are now schedulable and required to be schedulable for the web consoles deployments to work. OpenShift Container Platform 3.9 introduces the following notable technical changes. As of OpenShift Container Platform 3.9, manual upgrades are not supported. In a future release, this process will be removed. In previous versions of OpenShift Container Platform, master hosts were marked as unschedulable nodes by default by the installer, meaning that new pods could not be placed on the hosts. Starting with OpenShift Container Platform 3.9, however, masters are marked schedulable automatically during installation and upgrade. This change is mainly so that the web console, which used to run as part of the master itself, can instead be run as a pod deployed to the master. Starting in OpenShift Container Platform 3.9, masters are now marked as schedulable nodes by default. As a result, the default node selector (defined in the master configuration file’s projectConfig.defaultNodeSelector field to determine which node that projects will use by default when placing pods, and previously left blank by default) is now set by default during cluster installations and upgrades. It is set to node-role.kubernetes.io/compute=true unless overridden using the osm_default_node_selector Ansible variable. non-master, non-dedicated infrastructure nodes hosts (by default, this means nodes with a region=infra label) are labeled with node-role.kubernetes.io/compute=true, which assigns the compute node role. master nodes are labeled with node-role.kubernetes.io/master=true, which assigns the master node role. This ensures that the default node selector has available nodes to choose from when determining pod placement. See Configuring Node Host Labels for more details. Starting in OpenShift Container Platform 3.9, Ansible must be installed via the rhel-7-server-ansible-2.4-rpms channel, which is included in RHEL subscriptions. Default values for template_service_broker_prefix and template_service_broker_image_name in installer have been updated to be consistent with other settings. In an effort to provide greater flexibility for users, several instances of become: no on certain tasks and playbooks inside of openshift-anisble are now removed. These statements were primarily applied on local_action and delegate_to: localhost commands for creating temporary files on the host running Ansible. If a user is running Ansible from a host that does not allow password-less sudo, some of these commands may fail if you run the ansible-playbook with the -b (become) command line switch, or if it has ansible_become=True applied to the local host in the inventory or group_vars. Elevated permissions are not required on the local host when running openshift-ansible plays. If target hosts (where OpenShift Container Platform is being deployed) require the use of become, it is recommended that you add ansible_become=True for those hosts or groups in inventory or group_vars/host_vars. If the user is running as root on the local host or connection to the root user on the remote hosts instead of using become, then you should not notice a change. Unqualified image specifications now default to docker.io and require API server configuration to resolve to different registries. The batch/v2alpha1 ScheduledJob objects are no longer supported. Use CronJobs instead. For new installations of OpenShift Container Platform 3.9 , disabling swap is a strong recommendation. For OpenShift Container Platform 3.8, the OpenShift Container Platform start node requires swap to be disabled. This is already done as part of the Ansible node installation. The oadm command is now deprecated. Use oc adm instead. The core workloads API, which is composed of the DaemonSet, Deployment, ReplicaSet, and StatefulSet kinds, has been promoted to GA stability in the apps/v1 group version. As such, the apps/v1beta2 group version is deprecated, and all new code should use the kinds in the apps/v1 group version. For OpenShift Container Platform this means the statefulsets, daemonsets, and deployments are now stable and supported. In OpenShift Container Platform 3.9, the Administrator Solutions guide is removed from the OpenShift Container Platform documentation. See the Day Two Operations Guide instead. In the table below, features marked TP indicate Technology Preview and features marked GA indicate General Availability. [a] Features marked with * indicate delivery in a z-stream patch. Security, bug fix, and enhancement updates for OpenShift Container Platform 3.9 are released as asynchronous errata through the Red Hat Network. All OpenShift Container Platform 3.9 errata is available on the Red Hat Customer Portal. See the OpenShift Container Platform Life Cycle for more information about asynchronous errata. Red Hat Customer Portal users can enable errata notifications in the account settings for Red Hat Subscription Management (RHSM). When errata notifications are enabled, users are notified via email whenever new errata relevant to their registered systems are released. Red Hat Customer Portal user accounts must have systems registered and consuming OpenShift Container Platform entitlements for OpenShift Container Platform errata notification emails to generate. This section will continue to be updated over time to provide notes on enhancements and bug fixes for future asynchronous errata releases of OpenShift Container Platform 3.9. Versioned asynchronous releases, for example with the form OpenShift Container Platform 3.9.z, will be detailed in subsections. In addition, releases in which the errata text cannot fit in the space provided by the advisory will be detailed in subsections that follow. For any OpenShift Container Platform release, always review the instructions on upgrading your cluster properly. OpenShift Container Platform release 3.9.27 is now available. The packages and bug fixes included in the update are documented in the RHBA-2018:1566 advisory. The container images included in the update are provided by the RHBA-2018:1567 advisory. Space precluded documenting all of the bug fixes and images for this release in the advisory. See the following sections for notes on upgrading and details on the bug fixes and images included in this release. To upgrade an existing OpenShift Container Platform 3.7 or 3.9 cluster to this latest release, use the automated upgrade playbook. See Performing Automated In-place Cluster Upgrades for instructions. OpenShift Container Platform release 3.9.30 is now available. The packages and bug fixes included in the update are documented in the RHBA-2018:1796 advisory. The container images included in the update are provided by the RHBA-2018:1797 advisory. OpenShift Container Platform release 3.9.31 is now available. The list of packages and security fixes included in the update are documented in the RHSA-2018:2013 advisory. The container images included in the update are provided by the RHBA-2018:2014 advisory. Space precluded documenting all of the bug fixes and enhancements for this release in the advisory. See the following sections for notes on upgrading and details on the bug fixes and enhancements included in this release. OpenShift Container Platform release 3.9.33 is now available. The packages and bug fixes included in the update are documented in the RHBA-2018:2213 advisory. The list of container images included in the update are documented in the RHBA-2018:2212 advisory. OpenShift Container Platform release 3.9.40 is now available. The list of packages and bug fixes included in the update are documented in the RHBA-2018:2335 advisory. The container images included in the update are provided by the RHBA-2018:2336 advisory. error_class=NoMethodError error="undefined method `key?' for \"request\":String"
OpenShift Container Platform release 3.9.41 is now available. The packages and bug fixes included in the update are documented in the RHBA-2018:2549 advisory. The list of container images included in the update are documented in the RHBA-2018:2548 advisory. OpenShift Container Platform release 3.9.43 is now available. The packages and bug fixes included in the update are documented in the RHBA-2018:2658 advisory. The list of container images included in the update are documented in the RHBA-2018:2659 advisory. OpenShift Container Platform release 3.9.51 is now available. The list of packages and security fixes included in the update are documented in the RHSA-2018:2908 advisory. The container images included in the update are provided by the RHBA-2018:2907 advisory. OpenShift Container Platform release 3.9.57 is now available. The list of packages and bug fixes included in the update are documented in the RHBA-2018:3748 advisory. The container images included in the update are provided by the RHBA-2018:3747 advisory. OpenShift Container Platform release 3.9.60 is now available. The packages and bug fixes included in the update are documented in the RHBA-2019:0028 advisory. The list of container images included in the update are documented in the RHBA-2019:0027 advisory. OpenShift Container Platform release 3.9.65 is now available. The packages and bug fixes included in the update are documented in the RHBA-2019:0098 advisory. The list of container images included in the update are documented in the RHBA-2019:0100 advisory. OpenShift Container Platform release 3.9.68 is now available. The packages and bug fixes included in the update are documented in the RHBA-2019:0331 advisory. The list of container images included in the update are documented in the RHBA-2019:0330 advisory.